RESULTS: Jose Antonio Rivera - KO winner in his first fight in 7 years! 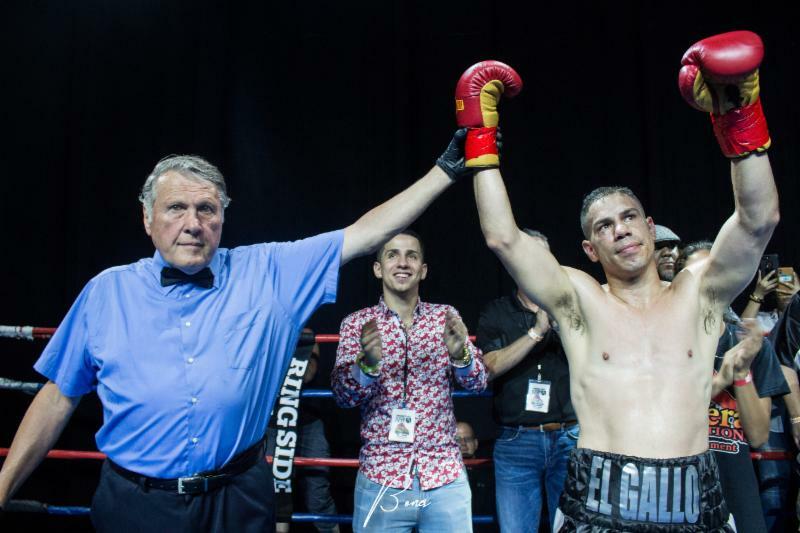 RESULTS: Jose Antonio Rivera – KO winner in his first fight in 7 years! Seven years after his last fight, “El Gallo” Jose Antonio Rivera returned to the ring in grand fashion last night (Saturday) to headline “Homecoming, presented by Granite Chin Promotions in association with Rivera Promotions Entertainment, at The Palladium in Worcester, Massachusetts. The 45-year-old Rivera (42-6-1, 25 KOs), 35 pounds lighter than he was in February when he started training, packed the house in his hometown, fully entertained his supportive fans. Three-time, two-division world champion Rivera pressured Larry “Slomoshun: Smith (10-38-1, 7 KOs) from the opening bell and he never let up. It took a few rounds for Rivera to wear off the rust, but he fed Smith a steady diet of body shots, gradually breaking down his opponent, as he won round after round on points. Twice in the sixth round it looked like Smith was done, but the tough Texan showed a lot of heart to survive. Finally, Rivera closed the show in the seventh round, when Smith broke his hand in the fifth round and was unable to continue, kneeling in his corner, obviously in pain. The rematch between Worcester junior middleweight Khiary Gray (16-4, 12 KOs) and Antonio Chaves Fernandez (9-34, 4 KOs) ended in the same fashion as their first encounter did three years ago. Also fighting at home for the first time, Gray blasted out his game opponent, cracking him with a picture-perfect, left-fight combination that put Fernandez on his back. Fernandez beat the count, but referee Bob Benoit halted the action. Southbridge, MA junior middleweight Wilfredo “El Sucaro” Pagan (5-0, 3 KOs) remained undefeated, using a relentless body attack to drop Engelberto “Guarura” Valenzuela (11-15, 3 KOs) three times, the last ending the fight midway through the third round. Springfield, MA junior lightweight Joshua Orta (1-0, 1 KO) turned in an impressive pro debut in a barn-burner that ended when (1-8-1, 1 KO), of Worcester, was unable to continue fighting after the third round. Worcester welterweight Eslih Owuso (1-0) pitched a shutout in his pro debut, decking veteran Bryan “The Brick” Abraham (6-31-2, 6 KOs) twice in the second round, en route to a unanimous decision win. In the opening bout of the night, 45-year-old Jose Angel “KO” Ortiz (5-14-1, 2 KOs) dropped Patrick Leal (0-5) 10-seconds into the fight, once more later in the opening round, and stopped him in the second. Oritz, fighting out of Springfield, MA by way of Puerto Rico, was fighting for the first time in five years, and he registered his first victory in seven. Patrick Leal (0-5), Somerville, MA. The official weigh-in was held today at Grille 57 for tomorrow night’s “Homecoming, presented by Granite Chin Promotions in association with Rivera Promotions Entertainment, at The Palladium in Worcester, Massachusetts. “El Gallo” Jose Antonio Rivera (41-6-1, 24 KOs), Worcester, MA 159 lbs. Larry “Slomoshun” Smith (10-37-1, 7 KOs), Dallas, Texas 155 1/2 lbs. Engelberto “Guarura” Valenzuela (11-14, 3 KOs), Agua Prieta, Mexico 156 lbs. Bryan “The Brick” Abraham (6-30-2, 6 KOs), Schenectady, NY 148 lbs. Jose Angel “KO” Ortiz (4-1-3-1, 1 KO), Springfield, MA 159 lbs. Three-time, two-division world champion “El Gallo” Jose Rivera has a new opponent for his comeback fight this Friday night in “Homecoming”, presented by Granite Chin Promotions (GCP) in association with Rivera Promotions Entertainment (RPE), at The Palladium in Worcester, Massachusetts. The 45-year-old Rivera (41-6-1, 24 KOs), who was matched against Ruben “Modern Day Warrior” Galvan, didn’t find out until yesterday (Tuesday) that Galvan had broken a finger the night before. Texas veteran Larry “Slomoshun” Smith (10-37-1, 7 KOs) is the late replacement for Rivera in the eight-round main event. Rivera last fought in 2011, taking an eight-round decision over Paul Mpendo, at Mohegan Sun Arena in Connecticut. The name of the event is “Homecoming” because five fighters in action are from Worcester, including three who’ve never fought there before as professionals. Super middleweight Kendrick Ball, Jr. (9-1-2, 6 KOs) and junior middleweight Khiary Gray (15-4, 11 KOs), both promoted by CES Boxing, will be fighting at home in Worcester as pros for the first time in a pair of six-round bouts. Ball faces Mexican Fabian “El Lobo” Valdez (2-3) in the co-featured event, while Gray (15-4, 11 KOs) faces Antonio Chaves Fernandez (9-33, 4 KOs), of Brockton, MA, in a rematch of a fight won by Gray. Also scheduled to fight on the undercard in four-round bouts are Southbridge, MA welterweight Wilfredo “El Sucaro” Pagan (4-0, 2 KOs) vs. Engelberto “Guarura” Valenzuela (11-14, 3 KOs), Springfield’s (MA) pro-debuting featherweight Joshua Orta vs. Worcester’s Edwin Rosado (1-7-1, 1 KO), Worcester’s pro-debuting welterweight Eslih Owusu.vs. Bryan “The Brick” Abraham (6-30-2, 6 KOs) and Springfield, MA welterweight Jose Angel “KO” Ortiz (4-13-1, 1 KO) vs. Somerville’s (MA) Patrick Leal (0-4). Event sponsors include Lundgren Honda, Elm Wealth Group, Atty. Maria M. Rivera-Cotto, Championsofhealth.USANA.com, Chieftain Liquors, Centro Las America, Baystate Savings Bank, Pamela Laporte Realty, Worcester Vocero, ChrisFIT Xperience and Grille 57 (hosting the official weigh in and after party). You are here: Home / Press Room / RESULTS: Jose Antonio Rivera – KO winner in his first fight in 7 years!